A Pack of Blood and Lies by Olivia Wildenstein is the first book of the new The Boulder Wolves series. This is the beginning of a young adult romantic paranormal fantasy series of which is probably obvious by the title and series names features Werewolves. Right before her eighteenth birthday Ness has to return to Colorado and her pack which she had run from years before. The Boulder Wolves were an all-male pack with the exception of Ness. Being the only female born to the pack in years Ness was not exactly welcomed and really still wants nothing to do with those she left. However, now that The Boulder Wolves need a new Alpha Ness sees this as her chance for a bit of revenge by challenging Liam Kolane for the title. Liam’s father had been the pack’s alpha for years and was as mean as they come so to keep the pack out from under another Kolane would be all he incentive Ness needs to win the challenges. I have somewhat of a love/hate relationship with werewolf books but having read other series by Olivia Wildenstein and enjoying them I had to give this one a try. Thankfully I was right and this was a much better wolf story than the adult versions of “your my mate let’s hop into bed”. 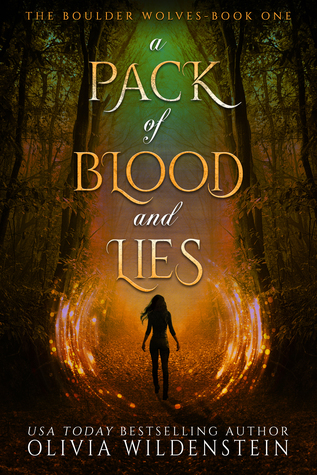 A Pack of Blood and Lies centers around pack politics and the mysteries of previous deaths in the pack along with the secrets and lies being uncovered within the pack. While I wouldn’t say it’s overly original in content it was a fun read and I’d be interested in seeing what the next book brings. Glad this was a winner for you Carrie. Nice review, even though I am not big on this genre.